We had so much fun the weekend Fire and Fury was released, we decided we were going to read a different book together every weekend. Well, maybe not together, but concurrently. 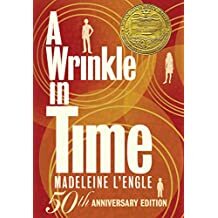 Since the whole family was excited for the release of a new film based on an old class which neither of us had read, we decided to start with A Wrinkle in Time. Like and equal are not the same thing at all. I have no idea how I had not read this one yet, but I really wish I had. I thoroughly enjoyed it and it was a fun, delightful read, but I think I would have enjoyed it far more at a younger age. I am not implying anything “wrong” with the book or even that it’s “just for kids” because I don’t think it is, I just think it would have been even more fun then. I zipped through it very quickly, found myself excited about the characters, what would happen to them, and how they would learn from their adventures. I think it’s a must read for any middle-schooler or pre-teen. Any kid who feels like an outsider might especially enjoy the read. Terri didn’t finish it the first weekend - mostly because she didn’t take to it as quickly as I - so the jury is still out on whether the next book in the series will be a shared book. If not, I’m going to read it anyway.